Many have opined that the younger generation does not care. Look at what this courageous 21-year old student in Long Island, New York has done, Danny Martins. He has been charged with with Disorderly Conduct and Criminal Nuisance for displaying an American flag and an impeach-Obama sign from a freeway overpass. He faces fines and possible jail sentence, if convicted. 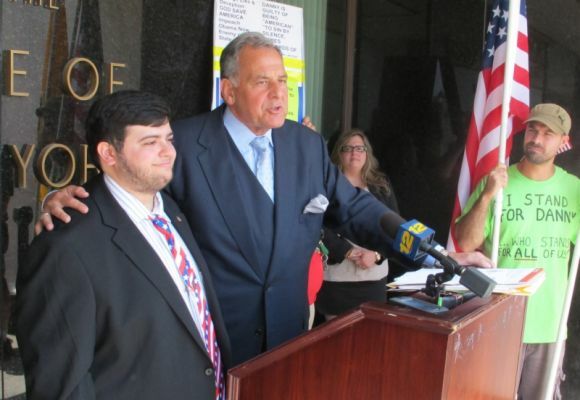 Danny had a court hearing scheduled for July 1st in Nassau County. The Judge got sick, probably with cold feet, not wanting to try this case and the court date was moved to August 8th. Danny’s attorney asked for an investigation of the District Attorney, Kathleen Rice, because her campaign posters for the coming election are known to often be posted on the same freeway overpasses. Danny belongs to an independent group of overpass protesters and conservative activists on Long Island. About 20 supporters were there for the court hearing. Will be posting more info about the outcome of the case at this link as it becomes public.